Properties in Harrison County average 4.6 out of 5 stars. Ethree Entire Place! Walking distance to the beach! Property 1: Ethree Entire Place! Walking distance to the beach! Entire Place! Walking distance to the beach! Property 2: Entire Place! Walking distance to the beach! A hidden gem in the heart of Biloxi. Beach bikes, Beach views, private,quiet! Property 3: A hidden gem in the heart of Biloxi. Beach bikes, Beach views, private,quiet! Spacious 3 Bed/2 Bath Apartment. Modern, Clean, with Gulfview. Property 7: Spacious 3 Bed/2 Bath Apartment. Modern, Clean, with Gulfview. Guest Apartment, 2bedroom 2 bth 1 Blk frm Beach/Jones Park,Gulf Views! Property 9: Guest Apartment, 2bedroom 2 bth 1 Blk frm Beach/Jones Park,Gulf Views! Hidden Gem! Walking distance to the beach! Property 10: Hidden Gem! Walking distance to the beach! Property 11: Lovely Apt close to Beach, Casinos, Dining & much more! DESTINY 7! Close to the beach! Property 13: DESTINY 7! Close to the beach! Save up to 20% Off! Lovely Villas w/ Resort Pool Near Golf Courses, Beaches, Casinos. Property 14: Save up to 20% Off! Lovely Villas w/ Resort Pool Near Golf Courses, Beaches, Casinos. 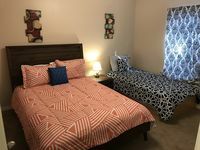 This property was very clean and comfortable and looks just as the pictures portray. It is located just a couple blocks from the beach and very centrally located. I did love my stay. The apartment was very clean. My guest and I were very pleased. The neighborhood was quite &amp; the people were very friendly.